For many, our mother was our first teacher, the first to inspire. She taught us how to count to 10, how to write our name and how to tie our shoes. More importantly, mom taught us life lessons and shared advice that we carry even now into adulthood. One of those well known pieces of advice that nearly every mom shared at some point, is “Sit Up Straight.” Turns out, this was really great advice since there are health risks due to poor posture. 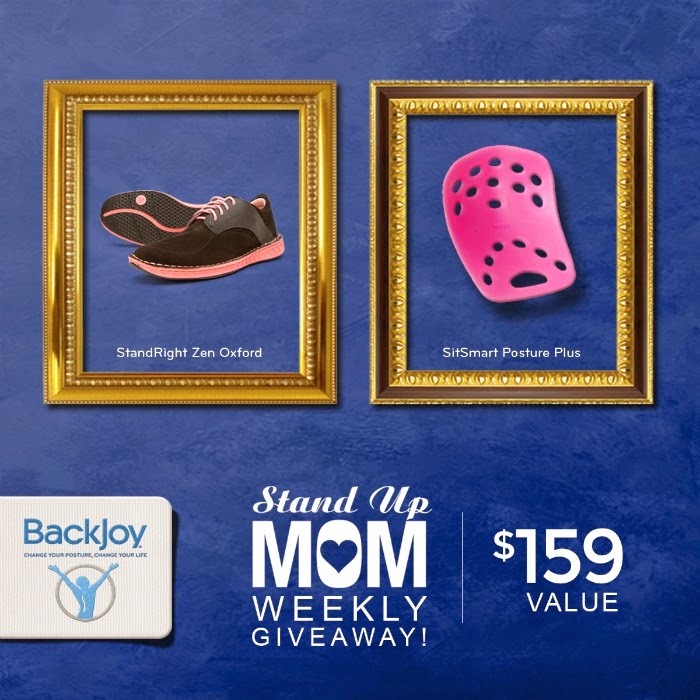 This Mother’s Day, BackJoy, the posture-experts, are hosting the Stand Up Mom contest to celebrate the words of wisdom from mom. Each week starting April 19th through May 9th, BackJoy will select one lucky pair (mom and the person that nominates her) to receive a pair of BackJoy’s new Zen shoes and a SitSmart seat (valued at $320). On Monday, May 11th, we will announce the grand prize couple who will receive a prize package worth $1,500 including the entire BackJoy product suite for two, two massage gift certificates, two floral bouquets delivered to your homes and a yummy edible bouquet each. Now for the Giveaway! One lucky winner will receive a SitSmart and Zen shoes from Backjoy! Giveaway ends May 13th at 11:59 CST. Open to US residents, ages 18+. One entrant per household. Void where prohibited. BackJoy Sweepstakes Disclosure: I receive no compensation for this publication. Prize is sponsored by Backjoy. Hosting blog is Motherhood Defined. The participating bloggers are not responsible for prize fulfillment. The winner will have 48 hours to respond to winning email or a new winner will be chosen. This giveaway is in no way associated with Facebook, Twitter, Instagram, Pinterest or Google. One entrant per household. Void where prohibited. Standard Size Pillow. I have so much trouble finding pillows that are of good quality. I also love the PostureWear Elite Sports Bra from BackJoy.